We live in New York City and we love it. Raising our kids here is no problem. Well…almost no problem. It can be a slight problem in the dead of winter. It can also be a problem on a rainy day. Come to think of it, it can be a problem on a hot, humid one as well. Two days in a row confined to an apartment and we all go a little stir crazy. We wanted a place to go for a change of scenery. We wanted a space that offers classes and allows our kids to run around and play with others. We also wanted a space where we can see some friendly adult faces. And...we wanted it in our neighborhood. So we created apple seeds. apple seeds operates all-in-one play spaces for families with children newborn to five. We are located in New York City in the Chelsea/Flatiron neighborhood, on the Upper West Side and in Peter Cooper Village Stuyvesant Town. We have incredibly unique indoor playgrounds designed by well-known children's museum designers, over 100 classes a week - from music classes like songs for seeds, to art, cooking, science, construction, ballet, tap, movement, gym, soccer and language. We host weekday and weekend birthday parties, playdates and corporate events. We have an award winning day camp and a kids' hair salon. We strive every moment of every day to be a safe, clean, fun place for our community to gather, socialize and play. We are Alison, Allison, Bobby & Craig. We all live in the Chelsea/Flatiron neighborhood in New York City, just blocks away from apple seeds 25th Street location. 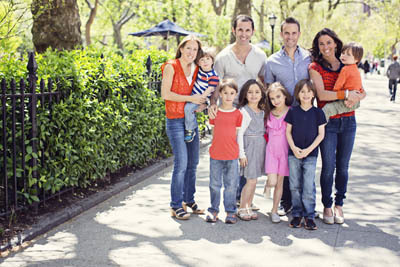 Allison, Craig and their 3 sons, Sam, Ari and Dov, live just north of apple seeds. Alison, Bobby and their 2 daughters, Maddie, Sydney and son Jack, live just west of apple seeds. We met 9 years ago in a neighborhood Music Together class and from that point on everything changed. We are always looking for friendly, energetic, enthusiastic, people who thrive in an environment filled with children and families.